The nail-parings of St Edmund made a cameo appearance in this week’s episode of the BBC’s adaptation of Wolf Hall. 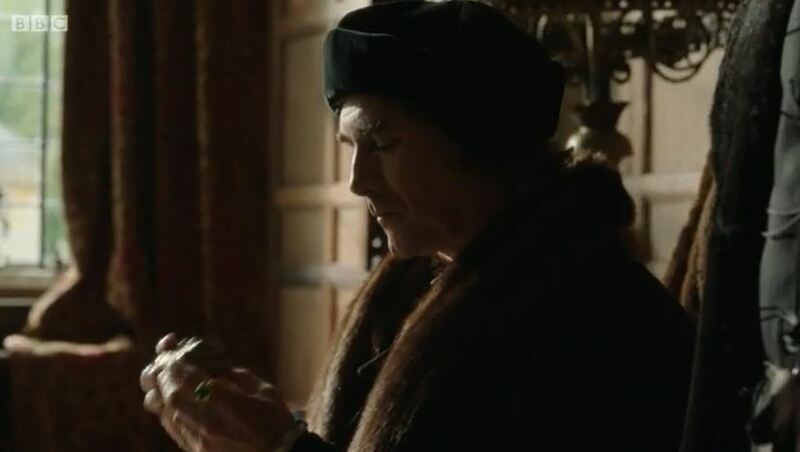 In one scene, Thomas Cromwell is presented with a box and asked to guess what it is. He shakes the box, wrongly guesses the teeth of St Apollonia or the teeth of St Mary Magdalene’s comb, before being told that it contains the nail-parings of St Edmund. This is a reference to a real letter sent to Cromwell on 4 November 1539 by John ap Rice, one of the Commissioners sent to dissolve the Abbey of St Edmund at Bury St Edmunds in Suffolk: ‘Amongest the reliques we fownde moche vanitie and supersticion – as the coles that St Lawrence was tosted withal; the paring of St Edmund’s naylls’. Passing over the historical inaccuracy of the nail-parings making an appearance in 1536 (three years too early), the unwary viewer of Wolf Hall might draw the same conclusion Cromwell seems to – that the parings of St Edmund’s nails are a recent invention of the monks, in a cynical attempt to take more money from pilgrims. In fact, the parings of St Edmund’s nails may have been as old as the cult of St Edmund itself. Furthermore, far from being a new form of fraud invented by the monks, because of the nature of the cult of St Edmund, the nail-parings were one of the few ways in which pilgrims could get close to the body of the martyr. The body of St Edmund was said to be incorrupt, and it was enclosed in an inner coffin inside the shrine and could not be seen or touched by the faithful, in contrast to some other bodies of saints. Indeed, St Edmund was supposed to take vengeance on those who touched his body unworthily, and the inviolability of the saint’s incorrupt body came to represent the inviolability of the political and ecclesiastical privileges enjoyed by the Abbey. However, pilgrims who came to the shrine wanted something more than just a view of the outside of the shrine, and the nail-parings of the saint offered something tangible to venerate, as well as a reminder of the early days of the saint’s cult in the ninth century. According to the earliest account of the martyrdom of St Edmund by Abbo of Fleury, written in around 985, when the body of St Edmund was found by searchers in the woods where he had been martyred by the Danes, it was taken to the small wooden church of St Mary in the town of Beodricesworth (the future Bury St Edmunds). Here the body was attended by ‘a certain woman of blessed memory called Oswen, who … passed many years in succession near his consecrated tomb, absorbed in fastings and prayers’. Oswen ‘made it her constant practice to open the sepulchre of the blessed martyr year by year, at the anniversary of the Lord’s Supper [Maundy Thursday], and to trim and pare his hair and nails’. The fact that the saint’s hair and nails continued to grow was, of course, continuing evidence of his incorruption. According to Abbo, Oswen collected the nail-parings and stored them in a casket on the altar of the church. In 1020 the body of St Edmund, along with the relics, was transferred to a new abbey church and put in the care of Benedictine monks. The fact that the monks chose to preserve the nail-parings is significant, because the monks justified their replacement of the secular priests who originally guarded the body of St Edmund on the grounds that the clerics were negligent. The nail-parings represented the care of the seculars (and indeed a laywoman) for the body of the martyr, something that the monks could easily have ignored and disposed of if they had suspected the nail-parings were not genuine. There is no reason to believe that the monks thought the nail-parings were fraudulent, and they represented an ancient component of the cult of St Edmund recorded by the saint’s earliest hagiographer. Thomas Cromwell himself wilfully misunderstood the medieval cult of relics, infecting English culture with that same misunderstanding for centuries thereafter. Hilary Mantel and the producers of Wolf Hall seem to embrace and encourage that misunderstanding, as well as suggesting that Cromwell’s belief that most relics were fraudulent means of exploiting the credulous actually reflected reality. The Cromwell of Wolf Hall feels righteous outrage at the wicked practices of the monasteries – I naively believed that people stopped thinking the monasteries were dissolved for genuine corruption in the nineteenth century. It is as if the revisionist historiography of the Reformation never happened. I fear for a generation of people who will grow up believing that Wolf Hall represents genuine history, and that the monks really did deserve to have their monasteries dissolved. The Wolf Hall franchise is rapidly becoming an apologist for one of the nastiest men in English history and one of the nastiest crimes: the dissolution of the monasteries was the destruction of medieval England’s memory, an irreparable loss for which this country can never fully atone. The dissolution of the Abbey of Bury St Edmunds and the fate of the relics of St Edmund is described in detail in my book Where is St Edmund? (2014). This entry was posted on February 20, 2015 by jacobite.